Resistance to a projectile or blast, fire, and forced entry. ShotBlocker™ is manufactured in five levels of bullet-resistance, depending on the threat and security function. The material can also be configured for threats exceeding Level 5 requirements. ShotBlocker™can be cut and drilled in the field with commercial quality circular, table, or panel saws. For aesthetic conformity, the material can be surfaced on site with veneer, drywall, wallpaper, or other wall coverings. Readily adheres to decorative laminates with the use of contact adhesive. Can be decorated with a wide variety of veneers, drywall, wallpaper, other coverings, etc. ShotBlocker™ meets the requirements for courtroom, check-cashing, gas station, and convenience market armor, providing superior security and protection in walls, doors, and counters. The material can also be used for military/defense architectural applications in the field, such as guard stations. Overall, ShotBlocker™ performs similarly to that of conventional S-glass laminates, which cost considerably more. ShotBlocker™ has also been tested to ASTM E84, Standard Test Method for Surface Burning Characteristics of Building Materials, by the hardwood Plywood &Veneer Association, Reston, VA, USA. HPVA is a recognized CABO, BOCA and ACBO testing laboratory. ShotBlocker™ significantly lowers the weight and cost of embassy safe rooms, while maintaining the structural integrity to protect government documents and personnel. The material is readily machined and is far lighter than steel, making it easier to install and repair. Its light weight also facilitates the relocation of safe rooms around the world. ShotBlocker™ meets stringent standards for ballistic and forced entry protection. Structures built with a combination of ShotBlocker™ and steel meet the highest DOS certification standard (Level 7) for ballistic-resistant structures. ShotBlocker™ is a light-weight, cost-effective steel alternative for armoring automobiles, trucks, jeeps, and aircraft. The material can also be combined with ceramic or steel strike plates as well as steel backer plates to increase impenetrability, formability, and durability. In the case of ground vehicles, the weight of large ballistic steel armor panels requires stronger suspensions, brakes, and engines than would otherwise be necessary. Steel armor may also compromise handling properties by raising roll centers and centers of gravity. Excessive weight is also a problem in airborne applications. The use of steel armor would result in significant reductions in aircraft performance, range, and payload. With its high flexural strength, compressive strength, tensile strength and hardness, ShotBlocker™ is a superior alternative for aircraft exteriors. And Synthane Taylor will work with you to develop custom ballistic materials for your specific requirements. ShotBlocker™ consists of woven glass fabric impregnated with a high-temperature phenolic resin system. The material provides superior flexural, compressive, and impact strength at elevated temperatures, as well as excellent creep resistance. Also, the phenolic resin system yields a ballistic laminate with superior fire, smoke, and toxicity ratings (ASTM E84) over conventional polyester resin fiberglass laminates. Glass fabric-based, anti-ballistic materials, such as ShotBlocker™, are far lighter than ballistic steel armor plate. The lower weight makes the material less cumbersome to fabricate, handle, and install. The manufacturing process utilizes state-of-the-art equipment for each step, from material preparation and treating to pressing and finishing. First, the substrate is processed through the resin compound. Then, the impregnated material is semi-cured in a treater oven. Once the material is treated, it is either issued to the customer as pre-preg, or sent to the press for sheet grades. Finally, the material is trimmed and packaged as required. 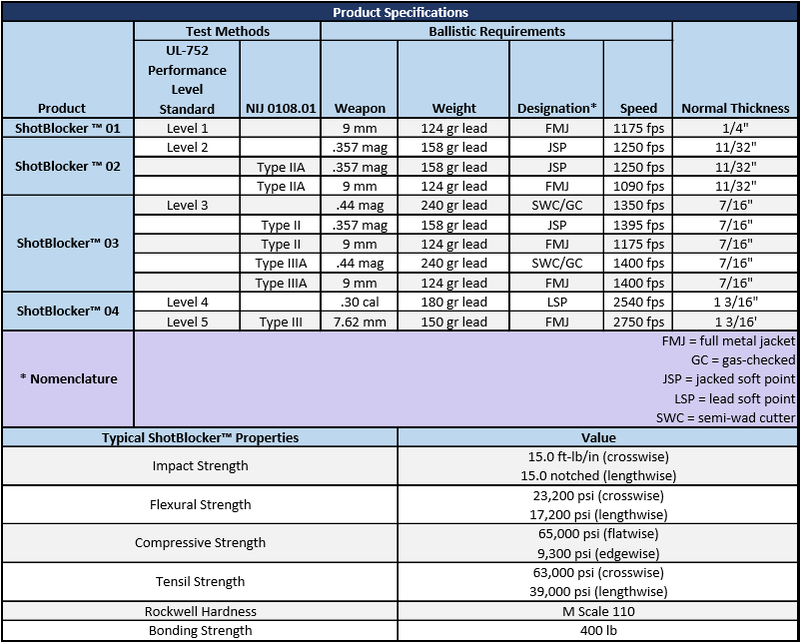 Product Specifications1Synthane Taylor is pleased to offer its customers ballistic protection materials in a range of sizes for a variety of applications. We can also assist in developing custom ballistic materials for customer applications.